Schnapsfest Fandanglery | I'm a little alien, sitting in a brain cockpit, controlling a giant fleshy robot. Play Tetrageddon Games. I will love you forever! 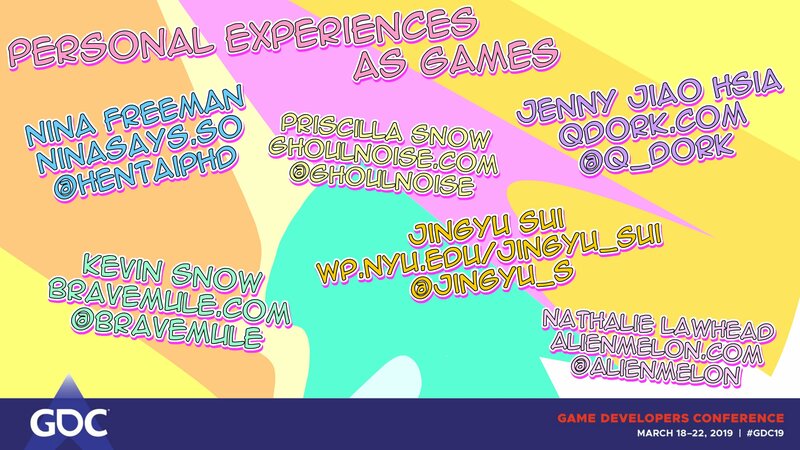 This GDC I co-organized a session called “Personal Experiences as Games” with Jingyu Sui. UPDATE: You can now watch the talk for free on the Vault here. I am posting my talk transcript and one slide here (my talk is bellow the following summary). The session was a set of microtalks about making games based on personal experiences… Along the lines of how artists have turned to games as a way of telling personal experiences, conveying deeper sensitive topics, personal messages, and using the medium as a tool to build empathy (I know the “empathy” discussion is a bit overused right now, but I think it’s an important facet surrounding games based on personal stories). Overall, this is a valuable thing to keep discussing as I think work coming from people that build such games is extremely relevant, and valuable. The way you approach building such games is very different from traditional game design approaches… at least I think so, since it’s about sharing personal things. Doing so isn’t exactly easy to begin with. Designing around such topics can end up becoming more about introspection and “facing yourself” than it is about making a game. I think such work brings a level of humanity into games that make them culturally relevant in a unique way. All of the speakers invited do amazing work in this area. Here is the lineup and links to their sites + Twitter so you can follow them. Overall, everyone presented beautiful thoughts. I learned new things, and can’t wait for this to go up in the vault so more people can hear it. Edit: It’s live on the Vault for free here. I loved Nina’s comments about building personal experiences that are happy, and how “happy” isn’t less valuable than broody or sad. That was relevant to me right now. If I remember right, Pricilla also brought up the issue of accessibility to work like this. There are lots of people that would LOVE games like this, but technical literacy, or video game literacy, keeps it inaccessible to them. Someone (I think it was Pricilla) also mentioned the value of making “mixtapes”. I paraphrase strongly, since I don’t remember exactly who said what. Kevin’s talk was really interesting too. My takeaway from that was the value of incorporating your own environment (surroundings, home, personal history as such…) into your storytelling. It was an interesting approach to building something like this. Jenny discussed failure, and the struggles you can encounter when building something larger (more long-form). This one was really inspiring. Her conclusion was to focus on your strengths, and I think it went in a valuable direction in terms of the importance of asking for help. Jingyu discussed how playing games can be therapeutic and help people overcome mental illness (PTSD, depression…). So… plenty of interesting things were brought to the table. Thank you everyone for coming to our Personal Experiences as Games session. we will be talking about games that tell personal stories, convey deeper sensitive topics, personal messages, and use the medium as a tool to create experiences that emotionally challenge the player. games about personal stories convey meaning and create an emotional connection with the player. That connection between the player and the person sharing in the game, is something special that stays with people even long after they’ve played these games. we’re starting to see this a lot when players talk about experiences they’ve had while playing alt and indie games… discussions about how a game helped them, challenged them to think about things, provided a coping mechanism, or made them cry in good ways. this brings up an interesting question; can games make people better? can they encourage people to be better people? can they help people heal or cope? we know what we’re doing, but maybe there’s more to what we can ask a player to master, and what mentalities this reinforces. who does this alienate? and maybe there’s a way to build games that ALSO include players that find these types of mastery alienating, so even more people can enjoy what you are creating. as “games built around emotion” are becoming more common, we see that there’s a vast realm of possibility for challenging players in different ways, outside of what we have normalized. i’m not saying one way is better than the other, but i think there’s an interesting space here that can make what you are building even better if you just include a little bit of that design awareness. for example, experiences where the difficulty curb is based around emotional intelligence, where the core challenge is interacting in ways that encourage people to be better. games based on telling stories that discuss mental health, and how we deal with that. an interesting observation i’ve had was when i was attending Play Date, a game’s showcase that’s part of the LA Zine fest. The showcase included a lot of games that are personal and experimental. The event audience had little to no game literacy. These are mostly people that assume games aren’t for them, because they find the surrounding culture too exclusive, or think games are too competitive and hard. They often got excited by playing these alternative games, and were surprised that games can even be this way. people discovered that games can be for them too. i think there is a large audience that we’re not reaching, because of our design language. i think that you can find a lot of success in having inclusive mindsets when you build something. the positive effects this can have are clear, especially when seeing how people react. people want to feel understood. by creating a space for such understanding we can form a type of emotional depth unique to games. …emotions, introspection, and relateability, can be a type of difficulty curb to design around both in the ways we ask the player to interact with our work, but also examine themselves. games coming out of the queer game’s space, and games made by women or other marginalized developers about their experiences, have broken a lot of ground for how to convey such subjects, especially more sensitive issues. work from artists like those speaking here today are great examples of this. itch.io is a wonderful place to start for exploring such work. here people are pushing the language of emotional design and there is a wealth of inspiration and knowledge coming from these communities. how do you balance sensitive topics? how do you speak on societal issues in meaningful ways? how do you establish that connection with the player, create a space for empathy, and relateability? too much undeserved attention goes into how games might be harmful, or encourage people to be violent. this is an unfortunate fixation from the “greater cultural discourse” that games find themselves in. i think we should start talking about how games can make people better. sharing personal stories makes people feel understood. it can bridge a gap from an alienating, or separate experience, to a very personal experience that people grow attached to, and grow from. games don’t only have to be about mastery of skill, they can encourage mastery of emotion, sharing, empathy, and other aspects we face in the real world. this matters because Gamers spend a lot of time in games. in many ways, games are an extension of reality, so why not design around emotional intelligence too? I’m really happy to have gotten through GDC in one piece. The weeks leading up to it were very emotionally draining. Mostly because of this (artist’s statement talks about it). Moving forward I’m going to not do talks anymore (unless I’m invited by an event that I’m really excited about, or know that the event is a safe-space). I love making things more than talking about them. I also love writing, so I’ll be sticking to those two things. I’m planning on getting into writing about games (like long-form criticism, and discussing people’s work that I like). I’m excited about that. I have a couple pieces lined up. I’m really happy about that since it’s something I’ve been putting off for years. I finally have a quality portfolio website that’s also super unique! You fly around as a little ghost (Tatghoul), talk to characters that gossip about me, and explore my work. I’m slowly building the circle of sites between unicornycopia.com, alienmelon.com, and tetrageddon.com. What I really like about alienmelon.com is that it’s all DOM based (CSS + JS). Not canvas. I wanted to avoid that. I had an older version of the site where I programmed all of that by hand, but managing so many states for the graphics was really hard (as well as keeping up with the cross-browser things). So I re-built that in a trial version of Tumult Hype. It was so much faster than doing it by hand. I love that program. ?? this is my next “big game project” (see quoted thread). a file town for your desktop. I’ve been telling people about it, but basically I want to turn your desktop into a world inhabited by cute files that you talk to, befriend, help… Like you would run it, and it plays out on your actual machine (over your OS and desktop), and you kind of get to know your computer in a new way. I want to work with taking an environment that we consider “dead”, or purely functional (your actual OS), and bring it to life in a capacity that you develop feelings for the things on it. So you have a little file-city, and files ask you to do things, and there are little stories. Sort of like the Microsoft Windows fever dream OS that’s in one of the Missing Pages of “Everything is going to be OK“, but not as a “constructed environment”. Something that plays out explicitly on your own machine. This thread talks about it more. I’ll write about it as I get more to show. I’ve been planning this a long time, and think it’s ready. Also to give you an idea for how this will interact with your machine, check out Electric File Monitor, Cyberpet Graveyard, and A_DESKTOP_LOVE_STORY. These three are me figuring out how to design something like this. This post talks more about the appeal of virtual pets and digital toys… if you are interested in the topic + philosophies going into this. I feel like I’ve been slowly building up to this for years. 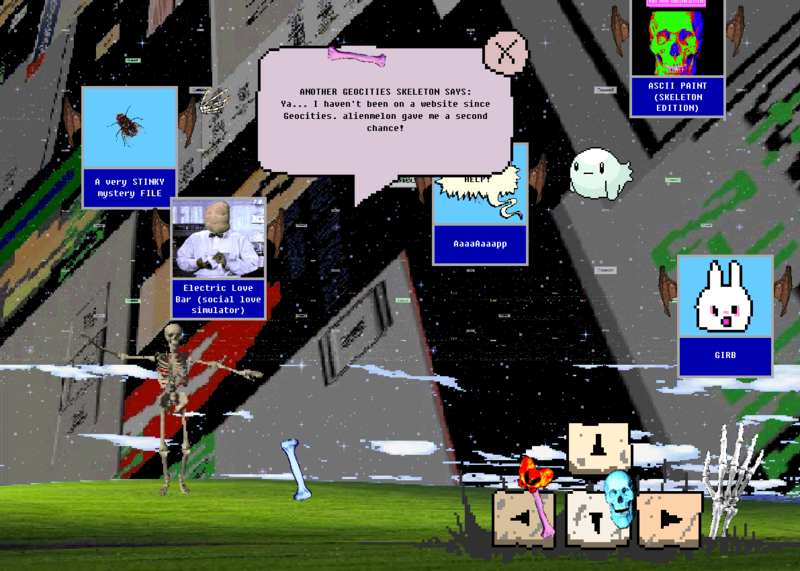 I did a few prototypes of what ended up being Cyberpet Graveyard back in 2012 (the “folder structure as a game” thing). It was always too unsubstantial to really materialize. I’m happy that it’s happening now. I’m also working on two other collaborations. I think those are going to be beautiful. What I'm saying in this is important, esp the conclusion. I don’t want to be written out of something that I’ve been doing for 10+ years, or for this to come to a point where people will say I’m copying something when I’ve been working with this topic basically forever. This is also so much of a discussion about privileged. If you want to support my work, right now the biggest support would be reading the above two tweets and re-share them if you feel so inclined.